It's pancakes with a side of politics. A Minnesota restaurant is passing along the cost of the state's minimum wage hike to customers, and the move has sparked outrage. 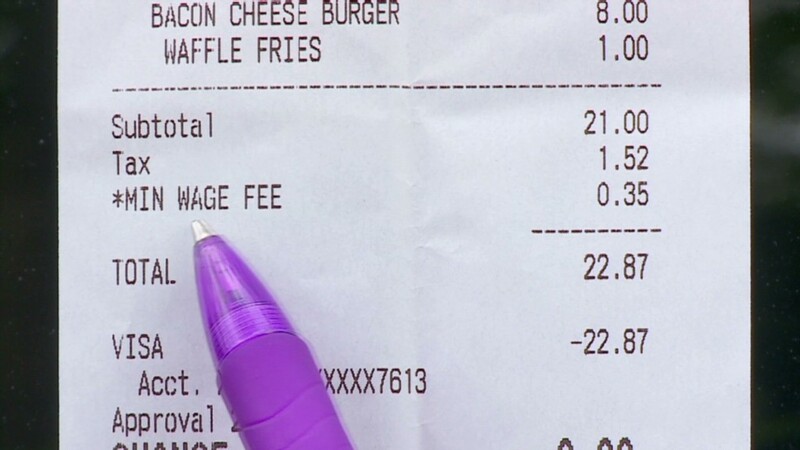 Diners at the Oasis Cafe in Stillwater, Minn., recently noticed a "MIN WAGE FEE" tacked on to the bottom of their receipts, beneath more mundane items like burgers and fries. The increase hiked the minimum wage to as high as $8 an hour for some workers. At least one diner, Jean Murra, noticed the fee on her check on August 1. "I was shocked," Murra wrote in an email. She said that she wouldn't mind if the restaurant raised prices a bit, but felt that the owners put the fee on the receipt "to make a political statement." "We will not go back there," she wrote. Hundreds of other commenters on the restaurant's Facebook and Yelp pages in the past few days felt similarly. Most of the comments are negative -- even unprintable -- and assume that the owners added the fee as a protest against the law. "We are coming to Minnesota next week and this was going to be a stop. No More," one Facebook user wrote on the page. In a statement posted to the restaurant's Facebook page on Friday, the owners, Craig and Deb Beemer, said they believed that the fee was "the most honest and transparent way to communicate a significant increase in our operating cost." "While our family is conservative in our views, it was never our intent to make some grand political statement," the Beemers wrote. A few customer comments were supportive, echoing the Beemer's statement that they faced new costs. "People come on now....a good business owner will raise prices if the cost of doing business goes up," wrote one user. Most dishes at the restaurant cost less than $10, according to a menu posted on its Facebook page. Restaurants have certainly used fees and surcharges to make political statements before: Back in February, diners at eight Gator's Dockside casual eateries in Florida found a 1% surcharge on their checks designed to "generate the additional revenue needed to cover the costs of" complying with the the Affordable Care Act, according to signs in the restaurants.